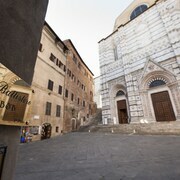 Hotel Athena is located within Siena's historic walls, near Piazza del Campo, Torre del Mangia, Palazzo Pubblico, Duomo, Museo dell'Opera Metropolitana, and Basilica di San Domenico. Castello di Brolio is 29 km (18 mi) away. Located in Siena Historical Center, this family-friendly Siena hotel is within a 5-minute walk of Piazza Salimbeni, University of Siena, and Piazza del Campo. Siena Cathedral and Santa Maria alle Scotte Polyclinic are also within 3 mi (5 km). Siena Station is 21 minutes by foot. Located in Siena Historical Center, this hotel is within a 10-minute walk of Monte dei Paschi, Stadio Artemio Franchi, and University of Siena. Piazza del Campo and Siena Cathedral are also within 15 minutes. Siena Station is 18 minutes by foot. Situated in the suburbs, this hotel is within 1 mi (2 km) of University for Foreigners of Siena and Santa Maria alle Scotte Polyclinic. University of Siena and Piazza del Campo are also within 3 mi (5 km). Siena Station is 23 minutes by foot. Il Chiostro del Carmine is located next to next to the University of Siena and within a 10-minute walk of Piazza del Campo, Duomo di Siena and Palazzo Pubblico. 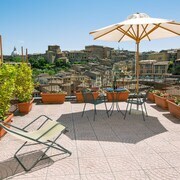 Located in Siena Historical Center, this hotel is steps from Siena Baptistry and Piazza del Campo. University of Siena and Siena Cathedral are also within 5 minutes. Siena Station is 24 minutes by foot. 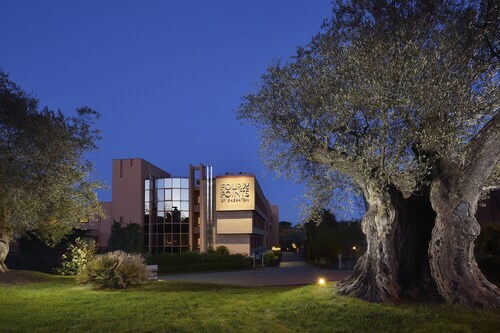 Situated in a rural location, this hotel is within 1 mi (2 km) of Siena Stadium and Santa Maria alle Scotte Polyclinic. University of Siena and Piazza del Campo are also within 3 mi (5 km). Siena Station is 19 minutes by foot. 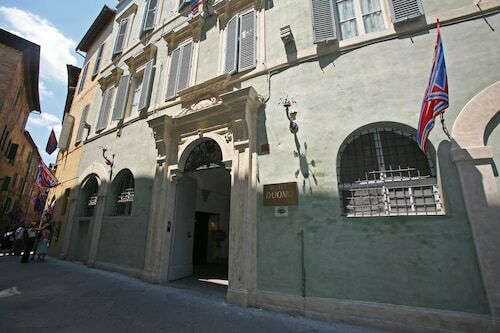 Located in the heart of Siena, this hotel is within 1 mi (2 km) of Stadio Artemio Franchi, University of Siena, and Museum of Torture. Piazza del Campo and Palazzo Pubblico are also within 1 mi (2 km). Siena Station is 8 minutes by foot. 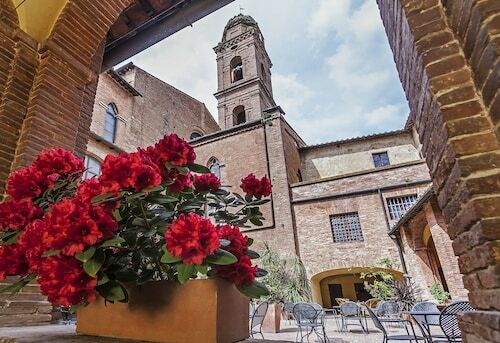 Located in Siena Historical Center, this hotel is within a 10-minute walk of Basilica di San Domenico and University of Siena. Piazza del Campo and Siena Cathedral are also within 15 minutes. Siena Station is 21 minutes by foot. Located in Siena Historical Center, this property is within a 10-minute walk of Piazza Salimbeni, University of Siena, and Piazza del Campo. Siena Cathedral and Santa Maria alle Scotte Polyclinic are also within 3 mi (5 km). Siena Station is 18 minutes by foot. How Much is a Hotel Room in Siena? 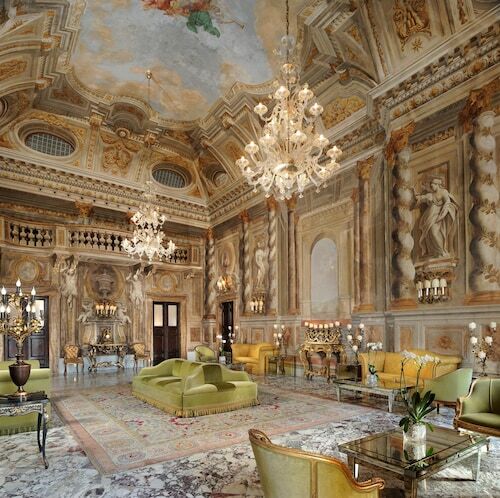 Hotels in Siena start at $70 per night. Prices and availability subject to change. Additional terms may apply. 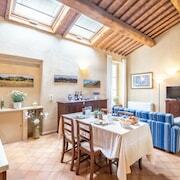 Travelers can unearth a range of accommodation options in Siena. 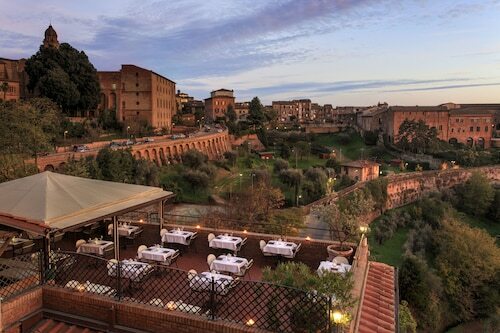 Travelocity features 125 hotel options within a 6-mile (10-kilometer) radius of Siena's heart. Wise travelers who get the important benefits of basing their adventures close to the action and bright lights of the city's heart should look at the Villa Elda and L'Alfiere, which are located less than 0.6 miles (1 kilometer) of Siena's center. Are you and your friends thinking about an exciting adventure to explore the popular Torre del Mangia in Siena? 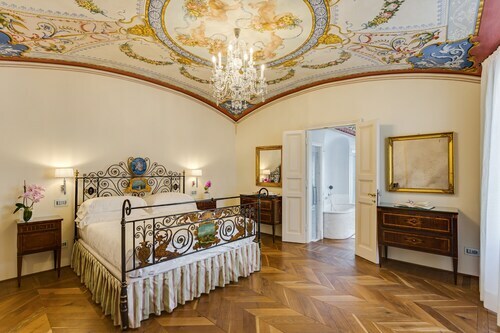 The Hotel San Marco and Le Meridiane can be found a few blocks away. 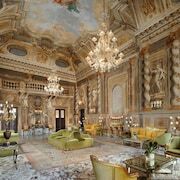 If you and your family are planning a trip to Siena so you can see the Siena Museo Civico, the Piazza del Campo or the Palazzo Pubblico, why don't you stay in a nearby hotel? 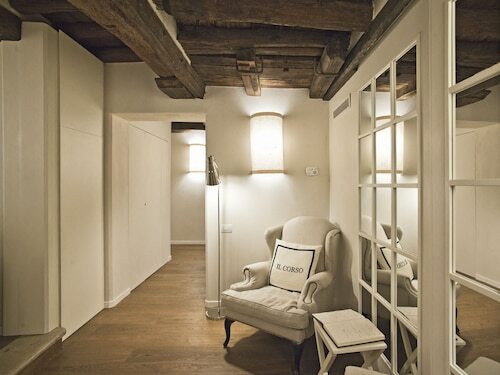 The Hotel San Marco and also the Le Meridiane are a stroll away from the Siena Museo Civico. While the Hotel San Marco can be found 1 mile (2 kilometers) from the interesting Siena Museo Civico, the Le Meridiane is 0.9 miles (1.4 kilometers) away. The Hotel Executive and the Hotel Siena Degli Ulivi are two hotel options very conveniently situated an enjoyable walk away from the Piazza del Campo. However, the Camping Siena Colleverde and the Borgo Grondaie are good options for those who prefer to stay close to the Palazzo Pubblico. 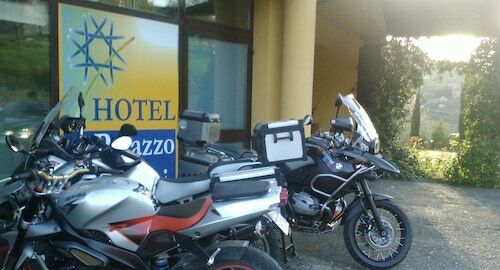 It's only 1 mile (2 kilometers) to the Camping Siena Colleverde and 0.8 miles (1.3 kilometers) to the Borgo Grondaie. 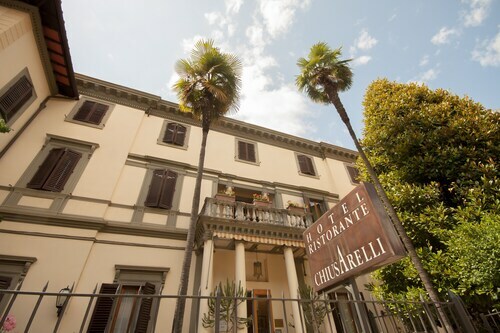 You'll learn the Hotel Porta Ai Tufi and Fonte dei Tufi are not far from the Teatro dei Rinnovati, and the Villa Il Borghetto and Residenza d'Epoca il Casato are within strolling distance of the Fonte Gaia. If you want to stay close to the Loggia della Mercanzia, choose from accommodation options such as I Tetti di Siena and Siena Gallery B&B. And finally, if your focus is on the Teatro dei Rozzi, your most convenient accommodations are the Il Battistero and B&B Le Lupe. The La Forra is located 14 miles (23 kilometers) from the middle of Siena. Another accommodation option is the Monache, which is 15 miles (23 kilometers) away. 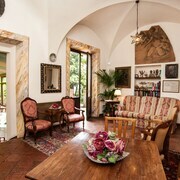 Alternate hotels are the Castelletto di Montebenichi and the Castellare De' Noveschi. On the hunt for things to do? Consider spending a day or two enjoying Monteriggioni Castle and San Leonardo al Lago, in Monteriggioni, 6 miles (10 kilometers) to the northwest of Siena. If you spend a few nights in Monteriggioni, be sure to check out the La Canonica di Fungaia and In Piazza. 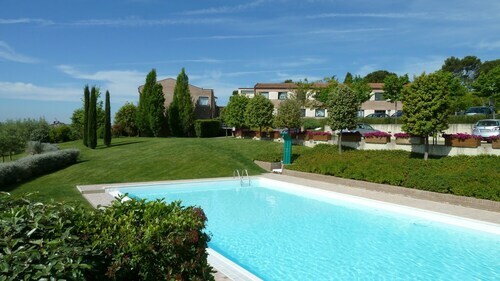 Or, you could consider staying in [name of second nearby city or town (sibling)], 7 miles (11 kilometers) to the northeast of Siena, where you'll find the La Pieve Marsina and Villa Brignole. The Chianti Sculpture Park, Berardenga Riding Centre and Torre dell'Orologio are more popular sites to visit when visiting [name of second nearby city or town (sibling)]. 18 miles (29 kilometers) to the northwest of Siena is San Gimignano, a regional center with a population of 7,000 and the home of tourist attractions like the Piazza Duomo, Piazza delle Erbe and Torre Grossa. 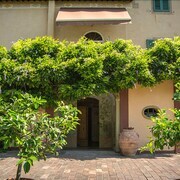 You might also like to visit the Sovestro in Poggio Winery and Piazza della Cisterna. If you're researching a holiday in San Gimignano, look into the latest Travelocity rates and amenities at the Relais Cappuccina Ristorante Hotel and B&B Ponte a Nappo. If you are traveling through Peretola Airport and need to stay in the area, look at Hilton Florence Metropole Hotel or Hotel Astor. Staff was friendly and recommended a nice restaurant for dinner. Room was basic but clean., should have asked for more towels and pillows! Great location! Alberto was excellent and had good recommendations! the room was comfortable, large and clean. Despite being right on a busy street, quiet with the shutters closed. Easy walk to bus station. Would definitely stay again! Hotel was in an excellent location. The staff was extremely nice and helpful. My husband and I were traveling with our college aged daughters. In order to put our 2 rooms on the same floor the hotel gave the girls a large suite with multiple direction views and more than one room. We did not ask for this accommodation they just gave it to us. Our room was a standard European double, no extra space but clean and comfortable. We had a view of the duomo and countryside. The included breakfast was pretty good they were even able to accommodate my soy cappuccino request. The directions to drive to the hotel were good and then they took our car and parked it for us. Excellent experience and we highly recommend this hotel.